DoomBuggies > Explore the history and marvel at the mystery of Disney's Haunted Mansion attractions! 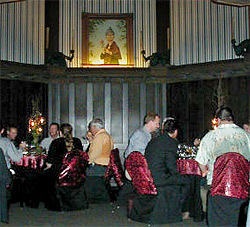 DoomBuggies Fan Central Special Event Reports Fan Submissions & Gallery Message Board & Chat DoomBuggies on Facebook DoomBuggies on MySpace Your Own Haunted Mansion email! "The Unauthorized Story of Walt Disney's Haunted Mansion"
A #1 Top Seller in "Theme Parks" on Amazon.com! When all 70 of us had arrived, we followed the half-dozen Suits and the 2 or 3 people who carried "crowd control" blinky red flashlights and walked as a group to the Mansion, from under the right side of the train station, up Main Street (it's so cool when it's empty), around the left side of the Hub, over the wooden bridge to Liberty Square, and onto the Liberty Belle Riverboat. Upon stepping onto the dock, we were offered small plastic cups of Guenoc Chardonnay. We were then encouraged to go to the top deck of the boat. From the boat you could see the Mansion in the distance, but it was slightly difficult to make out because it was already dark outside. Because of the bright lighting behind it, the scaffolding that's still around the atrium was simple to see though. Once the boat took off around the Rivers of America (without the usual prerecorded shpiel), we were treated to more bottle-poured wine, several Coca Cola products, as well as a variety of hors d'oeuvers (salmon sushi, baby peeled potatoes filled with sour cream and topped with chives, prosciutto and cream cheese on crackers, salami rolls and stuffed cherry tomatoes). Following the end of the riverboat ride, we were lead to the restrooms in Fantasyland that are next to Peter Pan's Flight (a good choice of facilities since those particular restrooms have LOTS of stalls). Once everyone was done and a male and a female Suit confirmed that the restrooms were empty, we were lead to the Mansion. We were gathered into the queue area of the HM, where an old, creepy woman was waiting to greet us. She told us to gather 'round her and once we had, she introduced herself as Madame Carlotta, the mistress of the Mansion. Carlotta was dressed in black, white and maroon with lace trim and she looked like she hadn't seen sunlight in several decades. She asked if any of us had been in the Mansion before; it looked like all of us raised our hands. She then asked if any of us were trivia buffs - several of us raised our hands. She went on to explain that we couldn't see it now because it was too dark, but the next time we visit the Mansion, to look at the roof of the building. Across the top of the HM there are all the pieces of a chess set except for one. Which one is it? A guest said she knew the answer - it's a knight. Carlotta said she was correct; the knight IS missing, because it's always night at the Haunted Mansion. She went on to explain that there would be samplings of 5 different types of wines with our 5-course meal and that each one was just a sampling, so don't expect more and don't ask for more, because it was just too bad (she said this so it sounded very lighthearted; as it turned out, you could have as much wine as you wanted, and several attendees DID get pretty shnookered). Carlotta led us to the main entrance of the Mansion and said she had a special surprise for us, because the doors had a new, mystical, special way of opening. She told us to say "Oooooh! Ahhhh!" and that would open the doors. We did it once and nothing happened, so we said it again and the doors slowly opened - by way of the person behind them. The person introduced himself as Broom, the head butler. Broom was a very tall man in a gray and black butler's uniform, with dust and cobwebs all over him. He explained that his job was to tell everyone about the meal they would be eating, but that first he would tell everyone where to go. After laughter, he explained that he would inform people where their assigned tables were, if they needed such assistance. The original owner of the land where the Guenoc Winery stands today was a famous Stage Actress named Lilly Langtry. The original house that Lilly built is still in full use today by the current owners of the estate, the Magoon Family. Countless guests of the home have seen Lilly's ghost over the years and strange occurrences happen there on almost a weekly basis. The Valley of the Moon is the name given to the Valley by the Native Americans that once roamed the valley. The chants of their past songs still haunt the Valley to this day. The famous author Jack London, started building a very large home in Sonoma overlooking the Valley of the Moon in 1935. A catastrophic fire burned down the house before it could be finished. There was no apparent explanation for the fire and attempts to re-build were thwarted by constant accidents and thus the home was never finished. The frame and basic structure of the house still stand today and reports of weird and unexplained occurrences are common in and around the original Jack London home site. 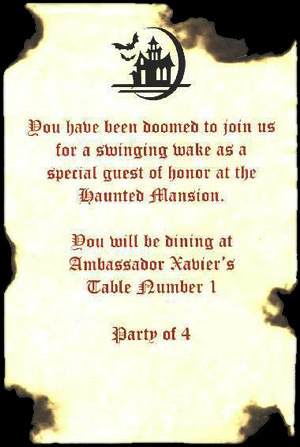 The Haunted Mansion theme song (slow organ version) quietly played in the background throughout the evening. The stretch rooms "stretched" and "unstretched" throughout the night, complete with lights going off and quiet thunder/lightning at regular intervals. Our servers for the evening were originally scattered around the rooms in various zombie-like poses. Once we were all seated, Carlotta explained that the servers were under a spell that made them unable to speak. True to her word, they could not speak but could grunt, gesture and point well. 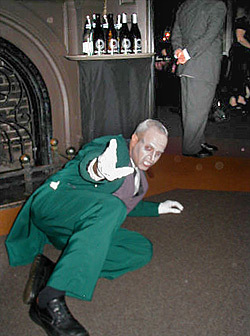 The servers were dressed in drab green and looked ghoulishly pale and unkempt. Someone suddenly LOUDLY banged at the front door of the Mansion, so Broom went to answer it. Outside was Abner, a scary but funny magician. Abner was tall, in a gray, black and white outfit that included a maroon turban. Carlotta had a funny/scary persona and Broom had several puns readily available. Abner intermixed jokes with slight-of-hand card tricks. Each course had a beautiful presentation and everything tasted delicious. I'm not a huge wine person and purposely didn't drink much because I wanted to really enjoy and remember this event, but the pairings (2 whites, 2 reds and a dessert port) seemed appropriate. After the end of the last course, we were bid farewell by Carlotta, Broom and Abner and were gestured by the servers to leave our seats, go into the pre-load area and board our Doom Buggies. There were no pre-planned surprises on the attraction, but from reading Caretaker's notes [on the Doom Buggies message board] over the past month, I was able to notice many newly-rehabbed audio and visual effects much moreso than in the past. Although there were no PLANNED activities, it WAS the first time that I ever saw the Mansion filled with an inordinate amount of drunk people. There were many more adult human shrieks and screams than usual, as well as a significant amount of flash photography. I also noticed that a lot of folks had significant problems with the moving sidewalks when getting on and off the ride. Some people were noted to try to hit Madame Leota's crystal ball with their "souvenir" red glow things in the Séance Room, using them as frisbees. Once we had all finished our ride, we were lead to the area just in front of the Columbia Harbor House, where we were offered another restroom break, in the restaurant's facilities. This time it was noted that the Men's Room had a line just as long as the Women's Room and the men just had no clue of how to handle that! Once everyone was out, they brought us to the southern part of Liberty Square. They lined us up into in the 2 nearby walkways, facing the Hall of Presidents. Once they were sure we were far enough back, for our own safety, a headless horseman on his steed came whizzing by. He made 2 passes in front of us and then vanished into the night (my pictures of him were the only disappointing ones I took - he was just too fast). From Liberty Square we were ushered to Main Street where they offered us the "Goodnight Shpiel" that they usually play when the MK is closing. Finally, we were loaded onto a waiting monorail (I saw one lady who needed the assistance of not 1, but 2 Cast Members to go up the ramp because she was so plastered) and whisked back to the transportation center. It was a perfect evening. I really, REALLY hope they do it again someday. Click here to return to the Fan Central page. 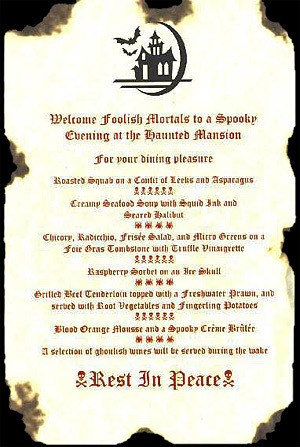 All Haunted Mansion/Phantom Manor/Disney images, sounds, and media copyright © Disney / Disney Enterprises, Inc. Website design © 1997 - 2011 by Chef Mayhem. and for Disney fans to promote Disney theme parks. DoomBuggies uses and recommends 1and1 Web Hosting.